Black antique iron ball cupboard knob on back rose. Available in 36mm diameter knob on 38mm diameter back rose. Black antique iron oval cupboard knob 35 x 25mm diameter oval knob on 38mm back rose. 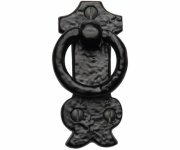 Black antique iron cabinet ring pull on tombstone pattern backplate. 35mm diameter ring pull on 80 x 40mm back plate. 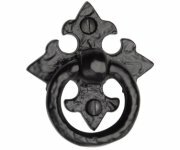 Black antique iron ring pull on gothic cross backplate. 65mm diameter ring pull on 61 x 61mm backplate. Black antique iron teardrop pull on tombstone pattern backplate. 80 x 36mm backplate. Black antique iron teardrop on gothic cross backplate. Height 85mm on a 56mm x 56mm backplate. 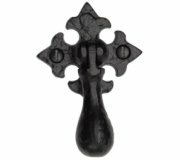 Black antique iron ball knob on gothic cross backplate. Available in 27mm & 32mm diameter knob on 63 x 63mm backplate. Black antique iron cup pull drawer handle, size 114mm. Face fix with screws supplied. 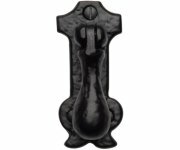 Black iron fleur de lys cupboard handles available in 102mm, 152mm, 203mm & 254mm length sizes x 27mm projection. Part of the smooth black iron rustic range. Black iron traditional cupboard handles available in 96mm, 152mm, 203mm & 254mm centre to centre fixings x 32mm projection.